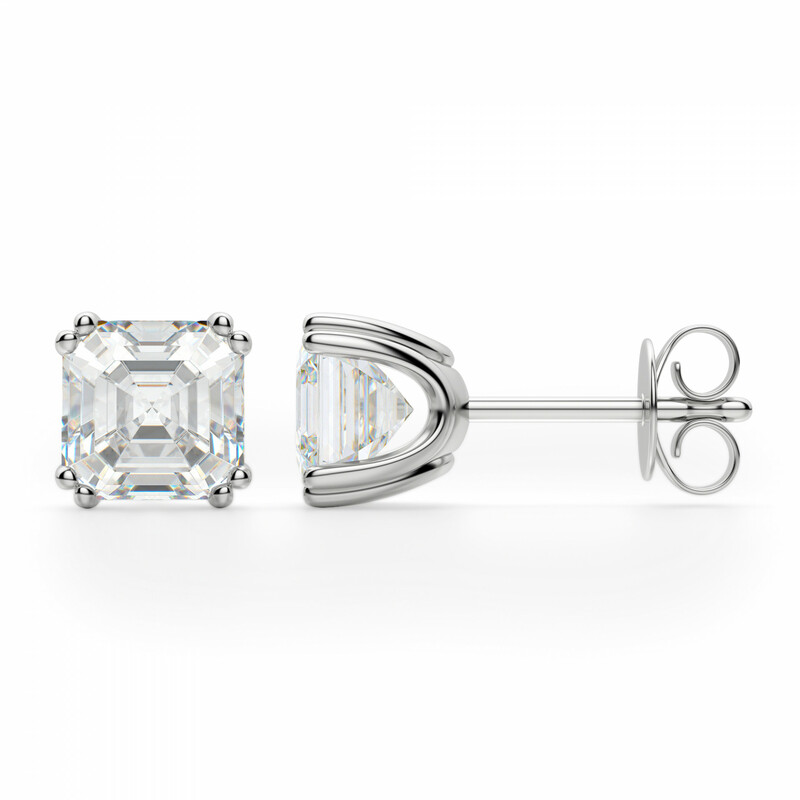 Asscher Cut Studs, Tension Back, Prong Set was added to your cart. I purchased the .99 carat earrings and I am very pleased with the purchase. These earrings are very beautiful and full of sparkle. I will be wearing these every day. I have purchased hybrid earrings from Mia Donna, but the Nexus diamond is much prettier. Will definitely buy again. I had lost a pair of real diamond studs ... I bought these to replace them , loved the fact that they’re not blood diamonds. I love love my new earrings and will never buy mined diamonds ever again! I absolutely love these earrings! So beautiful and classy, I’ll be wearing these for a long time. They are gorgeous! I love them--exactly the perfect size for my ear. At first I wasn't sure if they look exactly the same as diamonds, but I think it's just because they're so flawless that you normally don't see a diamond like that. They look exquisite and the quality is great. They came in a really lovely box too. Customer service process was great throughout as well. 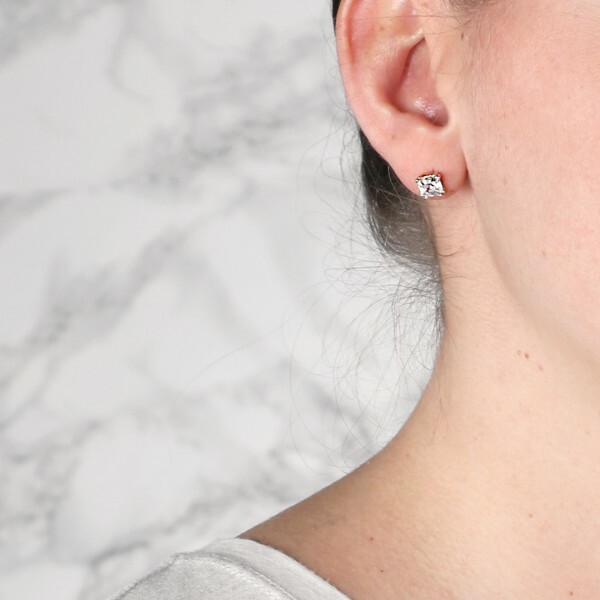 I really love the asscher cut for everyday wear, because they're more subtle than cuts with more sparkle, such as princess or brilliant, but still a lovely touch to any outfit. I'll definitely be buying from DN again. The Asscher cut is lovely and the packaging very beautiful. However, the stone itself is a disappointment and has zero sparkle so I returned it promptly. Customer service was wonderful and the company stands behind its products and cares about its customers. i love the asscher cut. however, these stones do not deliver the diamond sparkle look i had hoped for. Everything about this purchase surpassed all expectations I had about ordering from Diamond Nexus. From the incredible pricing, to the extraordinary package presentation, to the fiery display from the earrings themselves, I am a captive fan from here on out! The beautiful box within a box presentation was far more than I anticipated, as these were an indulgent purchase for myself. When I opened the main jewel box my eyes were greeted with a brilliant and dazzling light display from the extraordinary stones and the beautiful gold setting. I was hoping for fire that resembled my real diamonds, and this surpassed my wildest hopes! Wow! If you are waiting for the best diamond dazzle for the money, you have found it! And gentlemen, if you are wondering if these man made diamonds are worth it for your beloved, do not hesitate any longer. Yes, they are. Now go by your girl a nice gift that will thrill. 1 ct simplicity at its finest. I'll be wearing these as my signature earring! They are magnificent! I've been wearing these studs for over 4 years. They are one of my favorite pieces of jewelry. I highly recommend these classic earrings. The Stones are so Clear! Bought in the largest size they have... Absolutely amazingly beautiful stones, size was perfect! Yes, I like flashy things... only thing was that the earrings face down because of the weight/size of the stone. i think for this size, would have been better if the clasp at the back would somehow balance the weight of the stone on the earlobe. Still kept it but prefer to wear the round brilliant 1ct everyday. I loved my new earings the minute I saw them. Even the box they came in was beautiful. I am already getting compliments on them from those around me. These are so beautiful. I love the Asscher cut as it is a cut that isn't seen everywhere. These are appropriate for everyday wear or special occasion. 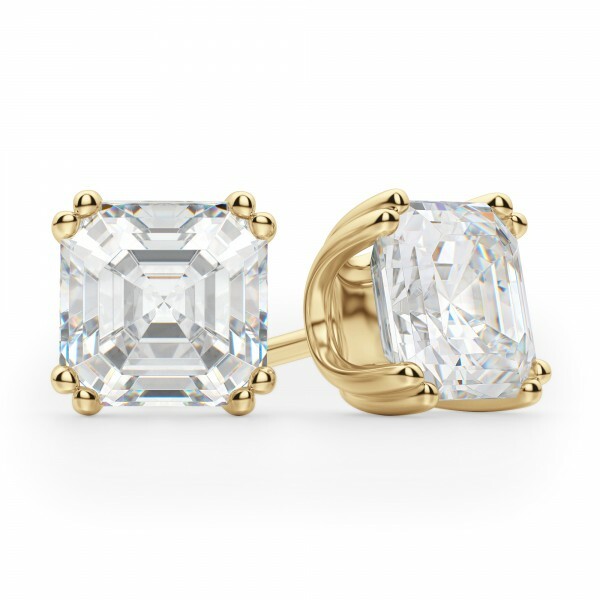 These earrings are so clear and so bright they outshine my real diamonds. I received them within 2 days in this enormous box...I felt like I was buying real quality from a company that is proud of their products. I will be buying more! The earrings are exquisite and everyhhing I had hoped for! I think this pair of earrings are quite exquisite. I would like to own a pair. I have always been drawn to the asscher cut. Received my earrings yesterday, great customer service, there was a delay in processing my order, DNL made up for it by upgrading to next day shipping for free so I still got them on time. It was only a day but this small detail made me feel really good about the company. The product, outstanding quality, the lights dance inside the Asscher cut, I am no diamond expert, and I probably couldn’t pick a real diamond from a CZ, but no one will mistake these for CZ the quality is apparent at first glance. Why pay high prices for an ideal, “diamonds are forever” lol conveniently we are not around long enough to confirm that theory. Save me the sentiments I’ll bet on science every time, especially If no one can tell the origin of your stone. After some research I find It so funny people attitude toward natural diamonds vs lab-diamonds, its like man kinds once firmly held belief that the world was flat or that science was witchcraft. I guess suckers are born every day, I won’t be one of them. Thanks Diamond Nexus for providing a sensible alternative, that’s well ahead of its time. It’s only a matter of time before everyone else catches on, you guys selling stock? Overall I am extremely happy with my purchase and would highly recommend. I love them! They are just what I expected and wearing them every day. Love the earrings will be buying more jewelry from Diamond Nexus in the future. 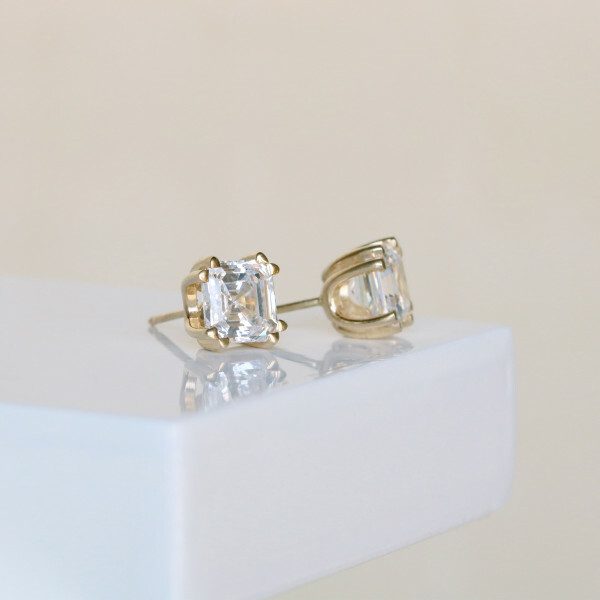 The earrings are beautiful, I have the same cut in my engagement ring which I got from Diamond Nexus 8 years ago. I went with the 1.98tw as my birthday present from my Hubby and I love them. Asscher is very intriguing but you would need to be close up to realize the cut is not a princess because the sparkle from a few feet away masks its uniqueness. The backs are nice and tight so I am not concerned with them falling off. All and all, very pleased and would buy them again. The Asscher cut's sparkle comes from deep within, like a hall with a thousand mirrors. They sparkle and catch the light perfectly, The setting is unlike all the other Diamond Nexus studs--there are 4 prongs, but they are curved rather than straight, which not only looks sophisticated, but provides a curved design counterpoint to the angle-centric Asscher cut. These are the perfect stud earrings; I haven't taken them off since I received them. Love! What woman hasn't lost an earring? 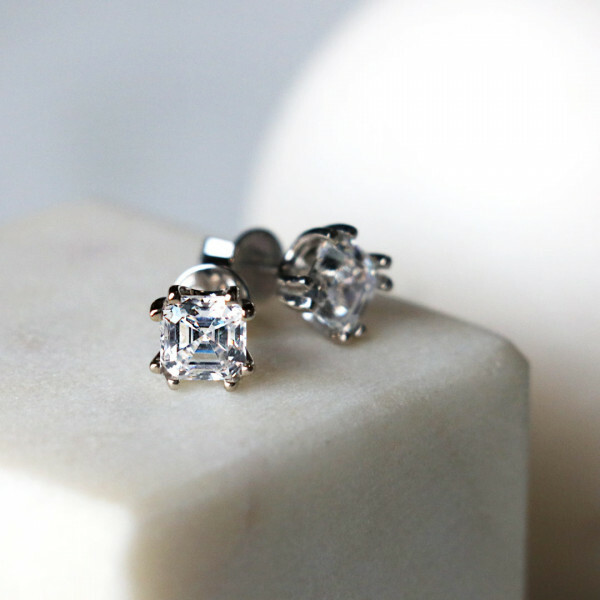 By knowing that it isn't just a matter of "if" rather than "when," why would you put REAL diamonds in your ears when you can have these beautiful stones instead? Due to the quality of the magnificent gold setting no one would know the difference if you don't tell them. While I wouldn't want to lose one of these, I would much rather lose these than the far more expensive real thing. Awesome quality product. I just got my earring and I can't tell you how happy I am with the earring. The glacial stone is so much more beautiful than I ever expected. I worked at Jerod for nine years and this stone surpasses any that I sold or saw. I can't wait to purchase one of your cross pendants with the princess stones. I want to modify the cross with some of the glacial blue stones to make it more unique. Thank you very much with your help in my purchase. I could not be more pleased.